Float Stone Ratings are based on a 1 to 5 scale. 1 is horrible. 3 is average. 5 is great. Float Stone, once again, finds itself leaving Standard rotation. It was first reviewed as the fourth best card of BW Plasma Freeze (https://www.pojo.com/COTD/2013/May/21.shtml), the second best card of 2013 (https://www.pojo.com/COTD/2013/Dec/1-4.shtml), the 7th best card lost to rotation in 2015 (https://www.pojo.com/COTD/2015/July/30.shtml), and another review shortly after it was rotated out due to being in XY BreakThrough (https://www.pojo.com/COTD/2015/Dec/3.shtml). Those reviews are mostly very favorable, as it’s meant to do one thing, and is successful in doing it. 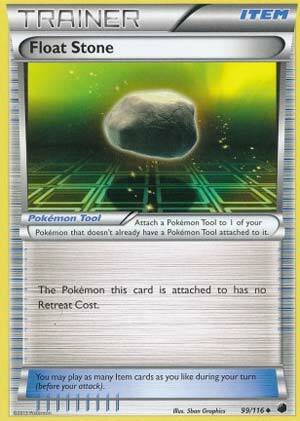 This is a Pokémon Tool which zeroes the retreat cost of the Pokémon this tool is attached to. This saves you from discarding energy cards that pays for the retreat cost, you still get to keep them! Even cards that increase the retreat cost will get overwritten, so even a CCCC plus 4 copies of Jellicent (BW Boundaries Crossed) which makes it CCCCCCCC will still get overwritten to be zero retreat cost. So already the effect is awesome! However, there are some Pokemon that can perform the pseudo-switch tactic, mostly promoting your Pokemon to the Active via ability and then manually retreat for free for a different Pokemon. Keldeo-EX, Zoroark (XY BreakThrough), and Dawn Wings Necrozma-GX comes to mind. Of course, such moving pieces can be interrupted by ability lock and Field/Blower, but otherwise, it is a great thing to have for the match. Combos associated with Float Stone on top of solid general use makes it rank high. While it will leave Standard, another one will fulfill a certain role, albeit weaker. In Standard, there’s Escape Board, which reduces retreat cost, but nowhere as powerful as Float Stone as it doesn’t cover all Pokemon with a retreat cost of two or higher. No matter which expansion you’re at in Limited, Float Stone will do a good job there. Float Stone will float away soon from the Standard format, and its zero retreat cost will leave us with pretty much zero in the way of a replacement. Fortunately, we have Guzma and some other switching cards (even some Pokemon with abilities that might let us do this), but nothing will completely fill the shoes left behind by Float Stone. Between May 19th and June 23rd this year, Float Stone was the seventh most common card played overall. 93% of decklists ran Float Stone, and those decks that ran it averaged 2.69 cards per decklist. It was the most popular Tool in the format, surpassing Choice Band as just a hair less than 50% of all Tool cards that were played. Switch (actually you can still run Choice Band if you run Switch, you can even potentially run Order Pad to improve your chances of getting it when you need it). But obviously none of these are as good as the original, irreplaceable, never duplicated but often poorly imitated Float Stone. I said it before: why does Pokemon continually power down cards? Why not make Escape Board free retreat even if Paralyzed or Asleep? Or even give players the option: Free Retreat or pay the retreat but still be able to retreat while Paralyzed or Asleep. At any rate, we’ll have to run four Guzma now, and Counter Catcher is really looking like a good card for spread decks. And have you seen the Oreococacolio from Celestial Storm? Keep your copies of Tapu Lele UPR handy. Octillery – massive draw support that could be searched out with ease, nowadays has the distinction of being one of the only main Pokemon draw Abilities, and now it’s getting rotated so sadness. Garbodor – finally we’re losing the Ability negator, as in the one that stopped all Abilities and not just the ones on specific Pokemon. He will be missed, but he’ll also likely not be missed by many. Potentially there’s room for another now. And now Float Stone – this Tool benefited a lot of Pokemon, including the aforementioned Garbodor. Its rotation means Escape Board is more accessible to those in Standard, but it will not likely have as many homes in different decks the way Float Stone did. Turns out free retreat is pretty darn good. Arora Notealus: So an octopus walks up to a dumpster with a stone in its tentacle. The dumpster asks, “Why the long face?” There’s no punchline, he’s just noting the elongated shape of the octopus’s head rather than pointing out that the octopus is hovering above dry land right now. Side Review: Lysandre Labs – really only useful against Tool-heavy decks, and right now I don’t think there’s too many of those. Also used in decks centered around the new Pyroar, but I don’t think that’s going to pan out majorly in the competitive scene. Garchomp – the Type change to him gives him better access to Fighting support, but we just lost out on Strong Energy, so now it’s mainly useful to have as an alternative Type to avoid dying immediately to Fairies. Having Grass Weakness isn’t too bad right now, and the Cynthia combination can be powerful with the right set-up, but otherwise it’s not likely to have any more of an impact than is predecessor. Tyrantrum – my personal vote for the best Fossil Pokemon card, and even then it hasn’t been able to break the mold. Despite Fossil decks being the most consistent that they have ever been with the new support, even Pokemon like Tyrantrum struggle with the same problems as most Stage 2 decks, that being the slow climb up the ranks. At least in Expanded it has access to Maxie’s.